As the leader in custom DJ Booth design and building, DJPeoples creates the highest class of custom DJ Booths for Retail and Corporate Brand events across the country. DJ Peoples also designs and build DJ Booths for mobile DJ’s across the country. Our specialized DJ Booths are chosen for their unique look and fashion style. As local taste makers in their local music and fashion scene, DJ Peoples’ DJ Booths poses their own visual way to appeal with customers while keeping them engaged and spending. Each DJPeoples DJ Booth goes through a step by step design and building process that ensures the highest quality for your brand to lure customers in, then to keep them there. 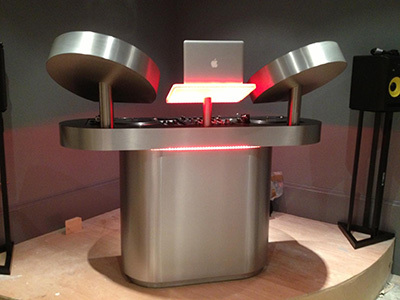 The 00 DJ Table can be ordered without the optional laptop stand. This product has been designed to hold 2 CDJ pedestals with space for a mixer up to 19″ width and two turntables. Please contact us if you’d like to discuss a different configuration.